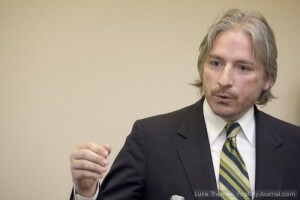 Matt Gonzalez is the Chief Attorney of the San Francisco Public Defender’s Office. Mr. Gonzalez served as a deputy public defender from 1991 to 2001. He successfully tried many cases while in the office, including serious felonies, three-strike cases and life-in-prison matters. As the Chief Attorney, Mr. Gonzalez is responsible for overseeing and managing all internal operations of the Public Defender’s office including the felony, misdemeanor, juvenile, mental health, and research units. In 2000, Gonzalez was elected to the San Francisco Board of Supervisors. He took office in 2001 and was elected by his colleagues two years later as president of the 11-member body. Gonzalez was the main sponsor of a ballot measure that created the highest minimum wage in the country. He authored groundbreaking legislation on elections and ethics reform, instant run-off voting, and commission appointments. He also proposed a measure to give immigrants the right to vote in municipal elections. Prior to his 2011 appointment to Chief Attorney, Gonzalez was partner in the law firm of Gonzalez and Leigh, where he handled both civil and criminal matters. During his five years in private practice, Gonzalez successfully litigated a number of federal civil rights cases, including the first punitive damages verdict against a sitting district attorney (Solano County) in California’s history. His firm also brought suit against Yolo County’s Superior Court challenging the lack of Latino representation on its Grand Jury, which brought important reforms. Gonzalez also successfully defended the head of Yolo County’s Housing Authority against corruption and other charges. The McAllen, Texas native received his Bachelor of Arts degree from Columbia University in 1987 and his Juris Doctor degree from Stanford Law School in 1990. He is the recipient of numerous awards, including the 2000 Lawyer of the Year award from the San Francisco La Raza Lawyers Association, the 2003 In Defense of Animals Guardian Award, and the 2004 Bert Corona Award from California’s Mexican American Political Association.